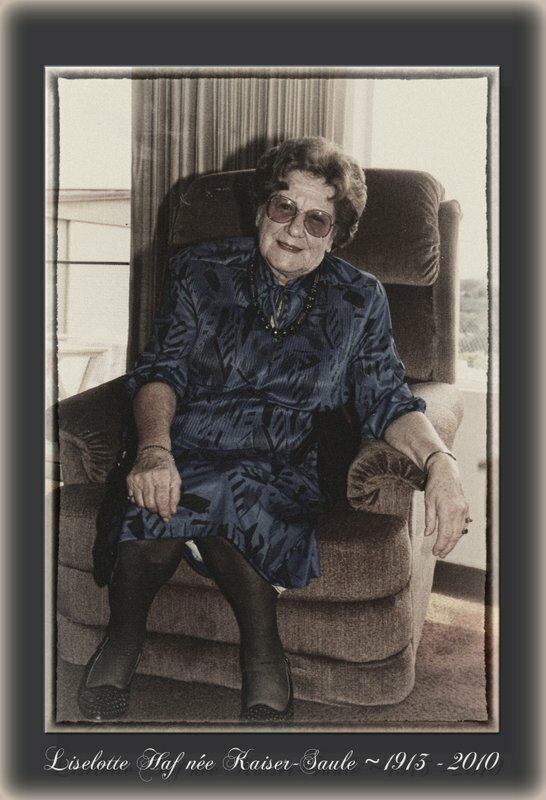 On this day, six years ago, my maternal grandmother, Liselotte Haf née Kaiser-Saule, (1913 ~ 2010), passed away peacefully in her sleep. Oma was 96 years old . . . she lived a long life. Oma survived her city, Augsburg, being bombed and having to take her twin boys to a shelter while my mom was carted off to a farm outside the city for safety for several months. She raised three wonderful children and was there for my grandfather, Adalbert (1907 ~ 1968) when he was shot in the shoulder while serving in the war. Photo taken at my wedding reception on, Sept. 24, 1988, in the home of Mr. and Mrs. Webb, my mother and father-in-law. My Oma was visiting from Augsburg, Germany, so we planned the wedding around her visit . . . what a blessing it was to have both Oma and my mom with me that day.